The Office of Mauna Kea Management (OMKM) the primary agency responsible for the University of Hawaii management areas on Mauna Kea, continued its efforts to malama Mauna Kea as volunteers helped pull invasive weeds and planted a hundred Mauna Kea silversword this past weekend. 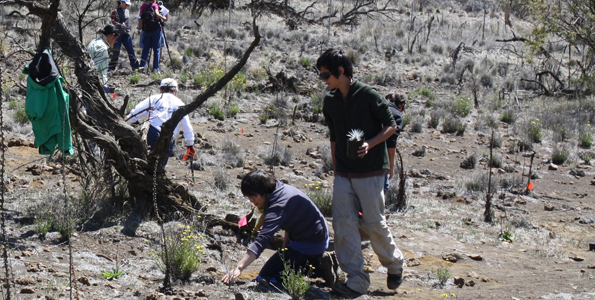 Organized by OMKM Natural Resources Program Manager Fritz Klasner, this ongoing effort is focused on restoring native habitat surrounding the Onizuka Center for International Astronomy Visitor Information Station on Mauna Kea at the 9,500 foot elevation. 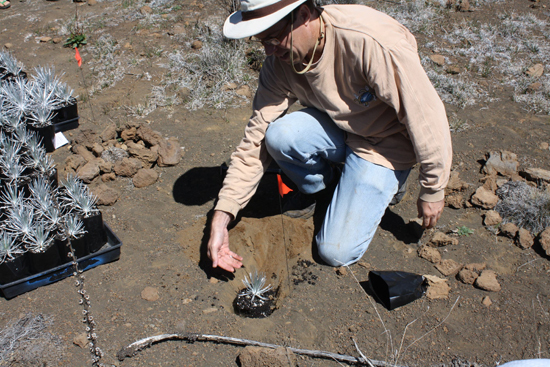 “Planting silversword keiki will help ensure the species existence on Mauna Kea for future generations. This was made possible by a record number of volunteers on Mauna Kea today helping us to take care of the mountain,” said OMKM Natural Resources Program Manager Fritz Klasner. “We started these invasive weed pull events at the 9,500 foot elevation last year and we’ve since logged over 1,500 volunteer hours. This past Saturday was our first replanting of native habitat,” he said. The state Division of Forestry and Wildlife (DOFAW) made the seedlings available to plant, provided planting instructions, and obtained needed permits. The plantings are in the division’s silversword enclosure near the Visitor Information Station. The Mauna Kea silversword is a member of the silversword alliance, a group of endemic Hawaiian plants that scientists believe all evolved from a single plant species which originated in North America several million years ago. Mauna Kea silversword grown naturally in the wild can live for more than 50 years. The nearly 100 newly planted silversword were grown in a DOFAW nursery. Once they establish a firm root system, which should take about a year, each plant is expected to live on Mauna Kea anywhere from 30 to 50 years. More than 35 community volunteers participated in the planting including students, businesses and several families. Volunteers began the day preparing planting locations, pulled invasive fireweed in the Silversword Enclosure, and then planting each silversword with a bit of love. Meetings and public hearings spanning a period of nearly two years went into the formulation of the Master Plan, which established management guidelines for the next 20 years. The process reflected the community’s deeply rooted concerns over the use of Mauna Kea, including respect for Hawaiian cultural beliefs, protection of environmentally sensitive habitat, recreational use of the mountain, and astronomy research. The Master Plan places the focus of responsibility with the University of Hawaii at Hilo (UHH). The UH-Hilo Chancellor established the Office of Mauna Kea Management and Mauna Kea Management Board in the fall of 2000.